took place in Burnett St yesterday morning. 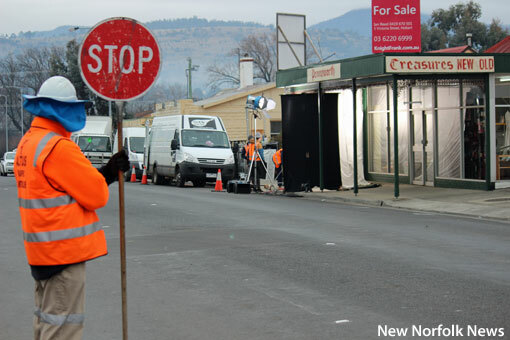 THE former ANZ Bank in High St was one of two locations in central New Norfolk being filmed for season two of the ABC TV comedy Rosehaven yesterday. Filming started in frosty and foggy conditions around 7am at Pennyworth Treasures in Burnett St. The production company shot exterior scenes early in the morning before moving indoors for further filming. 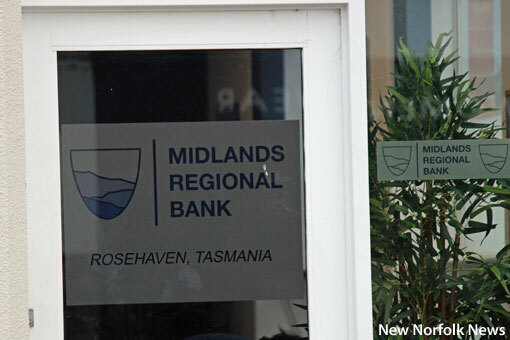 They then moved on to the old ANZ Bank in High St, which was transformed into the Rosehaven branch of the "Midlands Regional Bank". An exterior scene was performed outside the building before moving inside. Bank" in the old ANZ branch. Traffic on Burnett St was stopped for periods of one or two minutes during the outdoor filming at Pennyworth. The premises first featured as the Rosehaven Op Shop in the show's debut season last year. Despite losing the show's centrepiece - the Rosehaven real estate agency - to Oatlands, considerable work on the program's second season has been carried out in the Derwent Valley, in particular at Lachlan. Rosehaven's first season introduced Daniel McCallum (played by Luke McGregor) who returned to his home town in Tasmania to manage the family real estate business while his mother recovered from surgery. He was soon joined by his best friend Emma (Celia Pacquola). In season two Daniel will have to prove that he has what it takes to earn his place in the family business and Emma needs to decide whether small town life, and its "dangerously disinhibited locksmith" are enough for her. Also returning are Kris McQuade as Daniel’s mother Barbara, Katie Roberston as Daniel’s girlfriend Grace, Sam Cotton as Daniel’s bully Bruce, and Noela Foxtrot as the octogenarian receptionist Mrs Marsh.